Russia, Moscow, the Moscow Kremlin workshops, 1676. Makers F. Prokopyev, V. Ivanov. 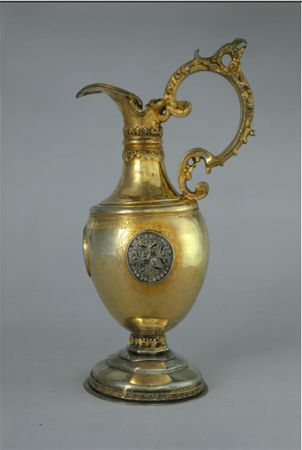 Belonged to Tsarevich Ivan Alekseyevich. Russia, Moscow, the second half of the XVIIth century. These vessels were traditionally used to decorate the dressers in the Faceted Chamber up to the end of the XIXth century. Form and decoration of jugs have been transforming during centuries according to changeable fashion. They were executed in classical, baroque and other styles with various ornamental patterns, types of spouts, bases and even handles. Different types of such a vessel were intended to serve as decorative tableware during feast and ceremonies. Wash jugs are worthy of particular attention. Washbasin sets, consisting of a bowl and ewer, were used to rinse hands at table. They were already known at the Moscow court in the XVIth century. Sets of the Armoury collection are mostly of foreign origin - they were brought in Russia as presents and ambassadorial gifts. 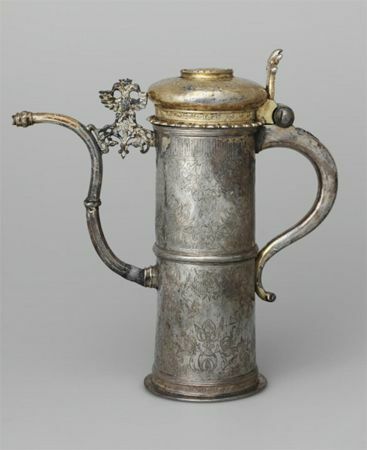 Among works by Moscow silversmiths there are two wash jugs-ewers which were commissioned for the young Tsarevitches Ivan and Peter by their older brother Fyodor Alexeevich soon after his accession to the throne. Two bowls of the set have not been preserved. The shape of one of these two jugs (img. 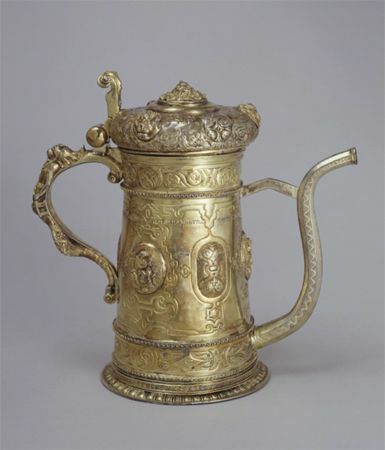 2) is representative of the time of its production; its handle is reminiscent of handles on German vessels of this type. It is significant that the craftsmen used imported, readymade components when executing the item. At this time works by German jewellers were widely exported to Russia.